Many time collector deviate from the main point of what art should be. We tend to believe that bigger is better and complicated composition is always the correct formula for a great work of art. 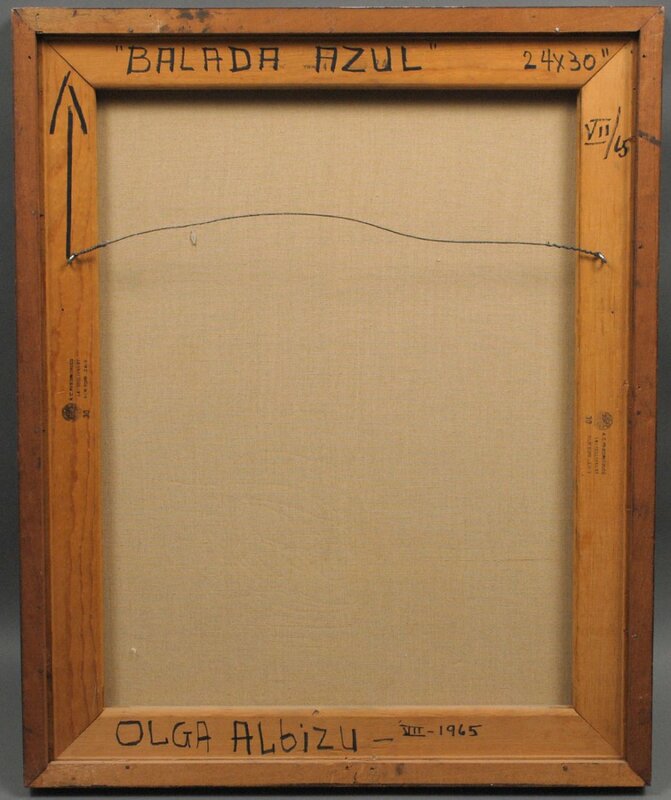 There is a Female painter that proof all this wrong and her name was Olga Albizu one of Puerto Rico pioneer in abstract expressionist artist. 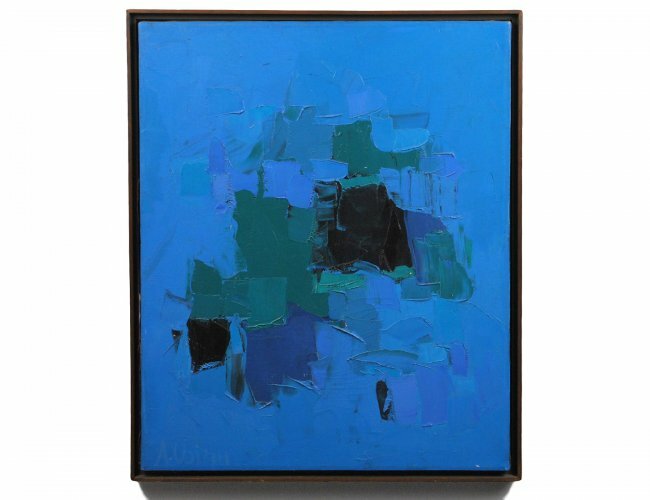 This painting called “Balada Azul” is a great example of a Simple abstract painting by Albizu this was here trademark style which in no way demonstrates a very complicated composition, but commanded lot of attention by the viewer. There is a dynamic balance of what seems hardly there against strong, forceful shapes composed of different tones of blue paint. Olga Albizu work requires a patient eye. It does not deliver the immediate punch like a Arnaldo Roche Painting would do, but still there a brief mystical glaze of mystery in all of her work that can only be seen in her palette. If you ask me, my true opinion of this work I would tell you that this painting is ravishing. It has the ability to make the spectator eyes lose focus and one’s gaze melts into the canvases, only to be “awoken” by small, dangerous brush fires where one color meets another. This painting has luminosity and radiance that still no painter that I know can bring to life. The blue color bleeds from one field into another so that we cannot truly say which aspect of the painting has been superimposed on the other. Olga Albizu works tend to be rare in the art market, and the reason is simple EVERY collector wants a painting by her, but they are very scarce and I would recommend any collector that Really is considering buying one to really check the authenticity of that piece since the art world is flooded by forgery trying to imitate her work. Balada Azul wins this month “Painting of the Month” but not for its complexity but for its simplicity in all aspect of the word.